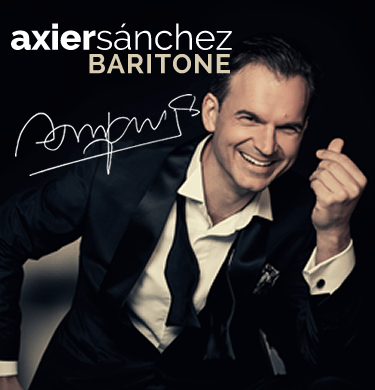 Baritone Axier Sánchez, warm and powerfull voice, with elegant stage presence, also he has performed in some of the best important spanish theaters such as Teatro Real, Teatros del Canal and Auditorio Nacional (Madrid), Teatro Arriaga and Palacio Euskalduna (Bilbao), Auditorio de Tenerife, Palau de la Música (Valencia), Palacio de la Ópera (A Coruña), Teatro Campoamor (Oviedo), also in Accademia Santa Cecilia (Roma) and The Pearl (Doha, Qatar) together with tenor Plácido Domingo. “Mr. Sánchez has a beautiful voice that he manages and projects certainly inspired. Always elegant and expressive”.